One of the things I love most about summer is all the variety of fresh and local fruit ripe and ready for eating. My mother and father in law have several fruit trees in their yard, and have supplied my husband and I with a bounty of small and super tasty peaches and plums this summer. So far I have made peach cobbler, peach crisp (twice), peach muffins, and peach jam. But what I really wanted was a tart, a bubbly, crispy and not too sweet— I think I found just the thing. I adapted a recipe from Barefoot Contessa (No joke!) 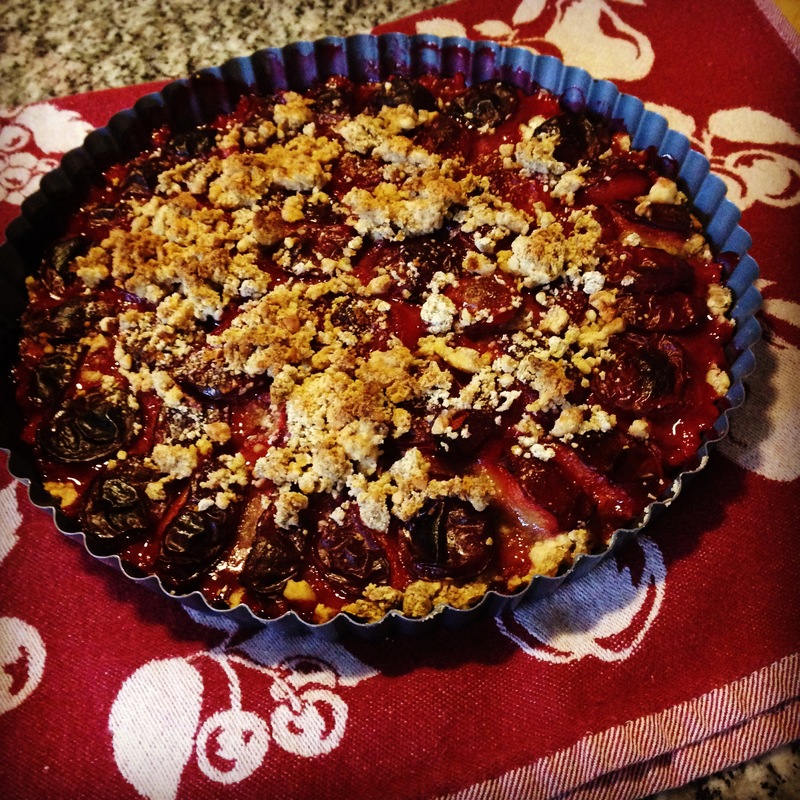 to create this plum tart, if you need some more sweet you can always add some brown sugar– but I think the plums stand alone just fine. Preheat the oven to 400 degrees F. Combine ground flaxseeds and water in small bowl, whisk them together and then set aside to give them time to gel. 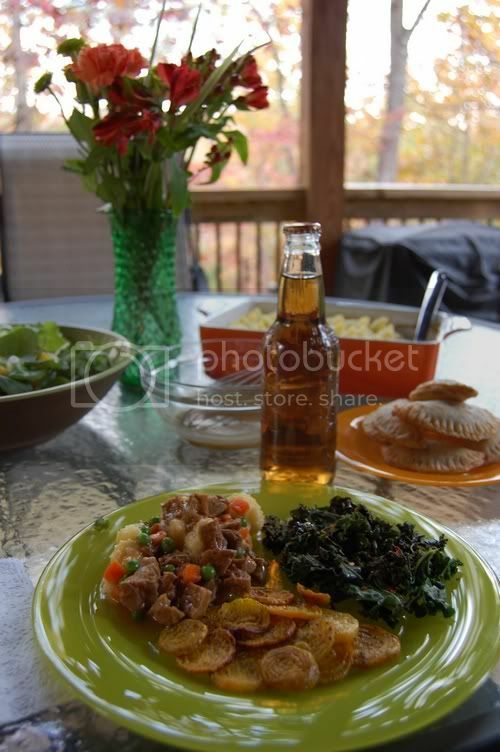 In a medium bowl using an electric mixer combine the flour and walnuts and mix until well blended. (I chopped the walnuts the lazy way by putting them into my mini food processor for a brief time). Incorporate the earth balance using a pastry cutter. Then add flaxseed mixture. Mix until the batter looks crumbly, about 3 minutes. Press about two thirds of the crumb mixture (1 1/2 cups) in an even layer into the bottom and along the sides of a 9 1/2-inch tart pan. Arrange the plums in the pan, skin side down, begin at the outside and work your way in. Sprinkle the rest of the crumb mixture evenly over the plums. Bake the tart for 40-45 minutes or until the top is brown and bubbly! It is often said that necessity is the mother of invention. I wouldn’t call my desire for a lemon cake on this snowy Valentine’s Day a true necessity…. but there are times in life when we all just need a piece of cake! She has a lot of great ideas for single serve desserts, but to be honest, they are too small for me. 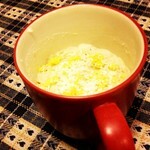 I have been making my own mug cakes that are a bit more filling, although I still wouldn’t share. Unable to venture out in the snow to get ingredients for my usual coffee cake in a mug, I discovered a bottle of lemon extract and a bit of shredded coconut leftover from making granola in my pantry. Thus, the lemon coconut mug cake was born. I tried with several different flour blends, and even once with protein powder until I nailed what I think is the perfect blend. Did I mention that this recipe takes less than 5 minutes, is vegan, gluten free, and incredibly easy? Grease the inside of a mug or ramekin. Combine all dry ingredients directly inside the mug or ramekin. Make sure you mix very well. And wet ingredients and mix to combine. Add about half of the lemon zest and coconut to the mix. Cook for about 1 minute in the microwave. Sprinkle with remaining lemon zest and coconut if desired! 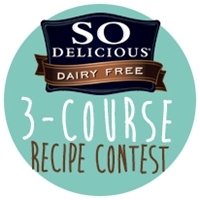 This recipe is part of the The Fast and Fresh “Dairy-Free Time Trials” Recipe Contest! Category: Less than 5 minutes! 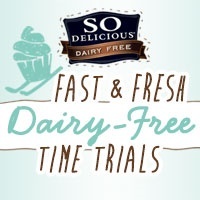 Categories: Desserts | Tags: baking, dairy free, dessert, five minutes or less, gluten free, healthy, single serving, vegan | Permalink. January has been a good month for me so far. Along with sticking to a spending fast, I have also set a goal to return to a consistent meditation practice, as well as return to running (albeit in a different and way) than I have in the past. Meditation is a practice that I have dabbled with for about two years now. In the past I have been consistent for a little while, then life would get busy—and I wouldn’t prioritize it any more. I know that I am a calmer, more grounded person when meditation is a regular part of my routine. I know that I am a sweeter wife and a more effective therapist when I simply start my day with deep breathing. In case you don’t know, gathas are short poems or verses that we can recite, regardless of where we are, to help us return to the present moment and to dwell in mindfulness. I finally found one that worked for me, and using this gatha as I meditate has helped me be consistent in my meditation for 10 days—the longest I have sustained a practice in quite some time. I know this is a wonderful moment! There are of course many variations of this, explained in Thich Nhat Hanh’s lovely little book, Present Moment, Wonderful Moment. I have found this little volume invaluable as I learn to practice mindfulness in my daily life. I am also learning that having a seated meditation practice is key for creating mindfulness in life. The other crucial piece has been choosing to meditate first thing in the morning, (rather than playing on my phone or on the internet, my usual morning routine!) Deepak Chopra calls this the “RPM” method—rise, pee, mediate. Trust me, it works. Some days I rise, pee, mediate, mindfully drink a cup of coffee, than meditate. But I am sitting, and practicing, and I can feel the difference. One of the unexpected ways that my mindfulness helped me, was this past Saturday when I ran a 10 mile trail race—the first race I had done in nearly 3 years. It was a very cold, windy morning and I was wondering why I even signed up when we were waiting to start. As we started running, navigating single track trails, and alone with each other and the breath, I found myself reciting the gatha. And each step that I took was wonderful. I realized I had to focus as I ran in much the same way that I do when meditating. Each step, each breath, was something new. A new root, a new rock, a fresh patch of mud met me at my every step. I finished strongly (although I am not sure of my place or time—practicing some non-attachment with that! ), and most importantly felt present throughout the entire run. I am eager to sign up for another trail race and practice my new favorite form of moving meditation. One final piece to share—on my spending fast I challenged myself to make my own chocolate instead of buying the expensive “Endangered Species” chocolate bars I usually favor. I figured I could save money and probably make it healthier too. Enter the world’s easiest and healthiest homemade chocolate! In a small pan, over medium heat, heat cocoa and coconut oil. Once combined, stir in coconut nectar. Once combined remove from heat and stir pecans in the mixture. Line an 8 x 8 pan with parchment paper, pour mixture into the pan, and spread with a spatula. Place entire pan in freezer, and let harden for at least one hour. I recommend storing these in the freezer if possible, I had to store mine in the back so I wouldn’t eat them all at once. You could easily sub 1 cup of any chopped nuts you would like, or add dried fruit, coconut, etc. Happy January friends. Enjoy deep breaths, time outside, and plenty of chocolate until we meet again! Categories: Desserts, Mental Health, Mindfulness, Recipes, Running, Spiritual Life | Tags: chocolate, gluten free, homemade, meditation, mindfulness, no added sugar, running, spending fast, spiritual life, trail running | Permalink. #1—It’s SUPER easy and takes next to no time to make. #2 —It’s not only VEGAN but also gluten free and soy free. My husband and I have often joked that we should actually buy stock in “So Delicious” because we consume so much of it. He is obsessed with the coconut creamer, which he puts in his coffee multiple times daily, and has even been known to travel to several different stores if he can’t find his preferred vanilla flavor. I am the coconut yogurt junkie myself. I love the “Greek style” and the plain, and it’s pretty much a fridge staple in our house. I eat it in smoothies, make popsicles, and even bread dough using coconut yogurt. This recipe was what we call an experiment gone well…and there are only 3 total ingredients! Combine yogurt, pistachios, and cranberries in a bowl until well blended. You might have to crush the pistachios using a food processor depending on how finely they are crushed. Line an 8×8 pan with parchment paper and spread mixture evenly in the pan, flattening with a spatula. Place pan in the freezer, and let it harden at least 1 hour, or overnight if you prefer. Remove from freezer and let them thaw about 10 minutes. Slice into squares and eat immediately. Freeze any unused portions! I imagine this recipe would be easy to do with any variation of the nuts and fruit, I just happen to really love the cranberry and pistachio combination. This would probably also work in popsicle molds—but I was really intrigued by the idea of making bars. And if you were wondering (like I was…) if coconut milk freezes well, this shows it can freeze beautifully! My husband and I get a produce box once a week in the months of April through November. 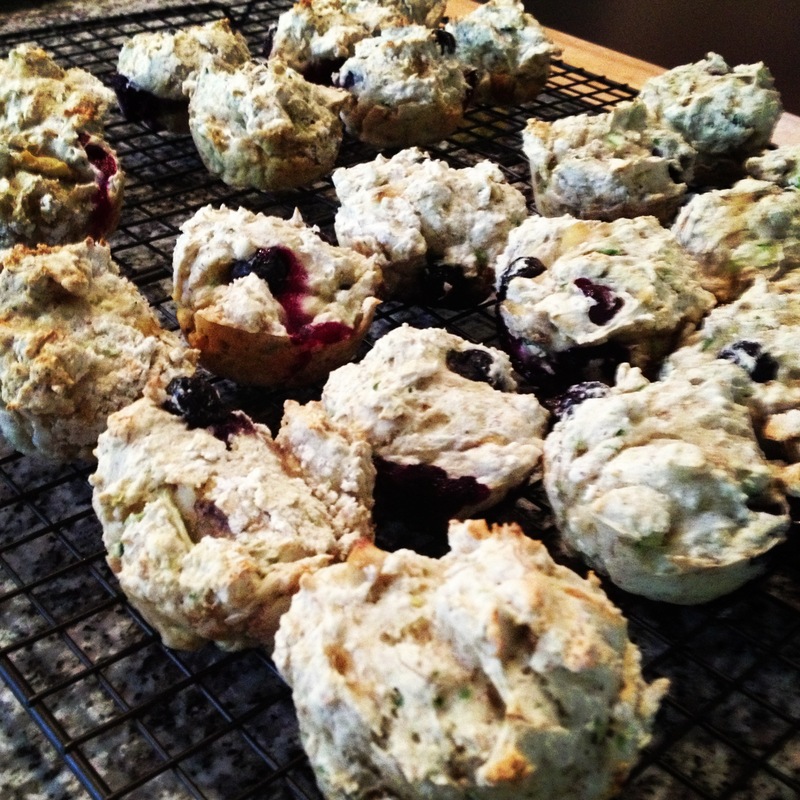 We get a lot of zucchini, squash and blueberries at this time of year, and I was looking for something different to do with all that zucchini– so I re-invented a favorite blueberry muffin recipe. Mine is vegan, high fiber, gluten free, has no added sugars. And delicious. In large bowl, combine together all wet ingredients and stir well. In separate bowl, whisk together all the dry ingredients until combined. Add dry ingredients to wet until you get a thick batter. Drop about 1/4 cup batter into 24 greased muffins tins, or use paper liners if you prefer. Bake 25 minutes, or until tops are very lightly golden brown. Yum! Categories: Desserts | Tags: baked goods, gluten free, no added sugar, refined sugar free, vegan, vegan breakfast foods, vegan snacks | Permalink.